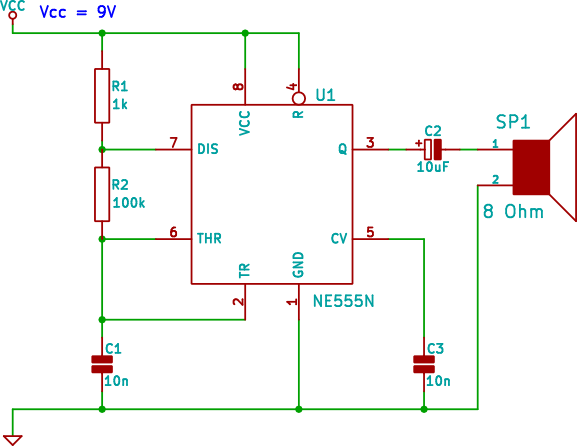 This circuit can easily be built on an electronic breadboard and uses a 555 timer IC to produce an audible tone of about 750Hz on a loudspeaker. The circuit can be used as a warning siren or in place of a buzzer. Although the circuit diagram shows the circuit operating from 9V, it should operate from about 5V to about 12V. An 8 ohm loudspeaker driven by the 555 IC produces the audible square-wave tone. This video shows the circuit operating and the frequency produced by the 555 being measured.